Russian opera singer Feodor Chaliapin (1873–1938) was an international sensation and is considered as the greatest Russian singer of the twentieth century, as well as the greatest male operatic actor ever. The possessor of a large, deep and expressive basso profundo, he was celebrated at major opera houses all over the world and established the tradition of naturalistic acting in operas. 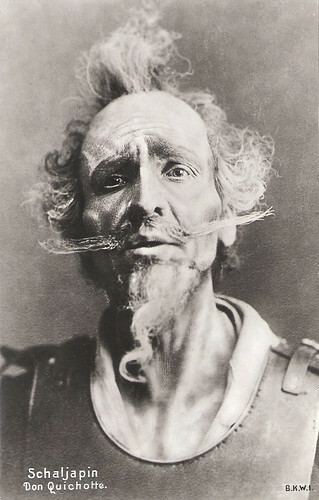 The only sound film which shows his acting style is Don Quixote (Georg Wilhelm Pabst, 1933). Russian postcard, no. 2036. Collection: Didier Hanson. Russian postcard, no. 499. Photo: K. Fisher. Publicity still for the stage production of Arrigo Boito's opera Mefistofele. 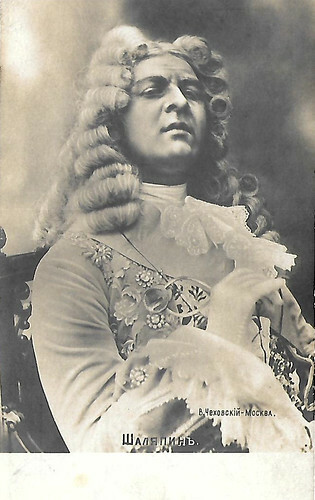 He sang the title role on the occasion of his first appearance outside Russia at La Scala, Milan in 1901 and also on his North American debut at the Metropolitan Opera, New York, in 1907. Collection: Didier Hanson. Russian postcard, no. 57. Photo: publicity still for the stage production of Modest Mussorgsky's opera Boris Godunov. Collection: Didier Hanson. 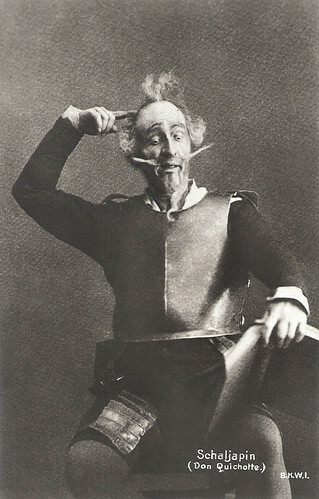 Feodor Chaliapin as Don Quixote. German postcard by B.K.W.I. Russian postcard by Dynamo, no. MB 22975-86, 1954. Feodor Ivanovich Chaliapin (Russian: Фёдор Ива́нович Шаля́пин, or Fyodor Ivanovich Shalyapin) was born in 1873, into a poor peasant family in Omet Tawi, near Kazan, Russia. His childhood was full of suffering, hunger, and humiliation. From the age of 10, he worked as an apprentice to a shoemaker, a sales clerk, a carpenter, and a lowly clerk in a district court before joining, at age 17, a local operetta company. In 1890, Chaliapin was hired to sing in a choir at the Semenov-Samarsky private theatre in Ufa. There he began singing solo parts. 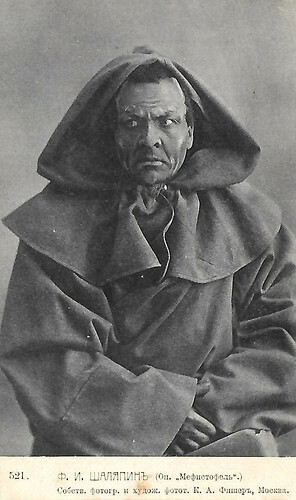 In 1891, he toured Russia with the Dergach Opera. In 1892, he settled in Tiflis (now Tbilisi, Georgia), because he found a good teacher, Dmitri Usatov, who gave Chaliapin free professional opera training for one year. He also sang at the St. Aleksandr Nevsky Cathedral in Tbilisi. In 1893, he began his career at the Tbilisi Opera, and a year later, he moved to Moscow upon recommendation of Dmitri Usatov. 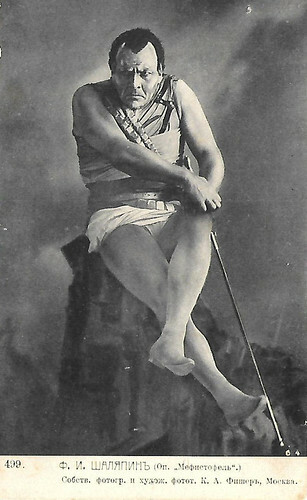 In 1895 ,Chaliapin debuted at the Imperial Mariinsky Theatre as Mephistopheles in Charles Gounod’s Faust, in which he was a considerable success. 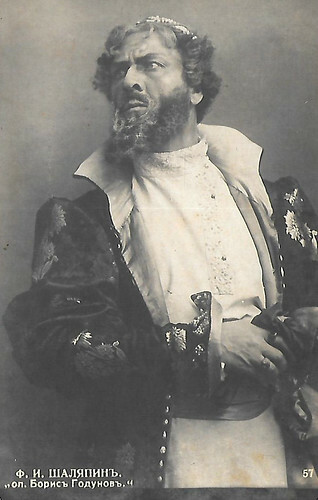 In 1896 he also joined Mamontovs Private Russian Opera in Moscow, where he mastered the Russian, French, and Italian roles that made him famous. Savva Mamontov was a Russian industrialist and philanthropist, who staged the operas, conducted the orchestra, trained the actors, taught them singing and paid all the expenses. At Mamontov's, he met in 1897 Sergei Rachmaninoff, who started as an assistant conductor there. The two men remained friends for life. 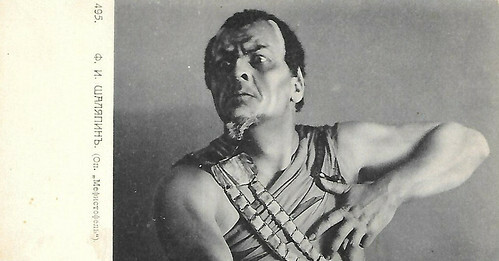 With Rachmaninoff he learned the title role of Modest Mussorgsky's Boris Godunov, which became his signature character. Rachmaninoff taught him much about musicianship, including how to analyse a music score, and insisted that Chaliapin learn not only his own roles but also all the other roles in the operas in which he was scheduled to appear. When Chaliapin became dissatisfied with his performances, Chaliapin began to attend straight dramatic plays to learn the art of acting. His approach revolutionised acting in opera. In 1896, Savva Mamontov introduced Chaliapin to a young Italian ballerina Iola Tornagi, who came to Moscow for a stage career. She quit dancing and devoted herself to family life with Chaliapin. He was very happy in this marriage. From 1899 until 1914, he also performed regularly at the Bolshoi Theatre in Moscow. The couple settled in Moscow and had six children. Their first boy died at the age of 4, causing Chaliapin a nervous breakdown. In 1901, Chaliapin made his sensational debut at La Scala in the role of the devil in Mefistofele by Arrigo Boito under the baton of conductor Arturo Toscanini. Other famous roles were Boris Godunov in Mussorgsky's opera, King Philip in Giuseppe Verdi's Don Carlos., Bertram in Giacomo Meyerbeer's Robert le Diable, and Ivan the Terrible in The Maid of Pskov by Nikolai Rimsky-Korsakov. 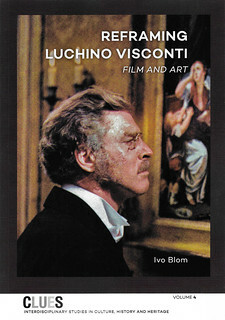 His great comic characterizations were Don Basilio in Gioachino Rossini’s Il barbiere di Siviglia and Leporello in Wolfgang Amadeus Mozart’s Don Giovanni. In 1906, Chaliapin started a civil union with Maria Valentinovna Petzhold in St. Petersburg, Russia. She had three daughters with Chaliapin in addition to 2 other children from her previous family. He could not legalize his second family, because his first wife would not give him a divorce. Chaliapin even applied to the Emperor Tsar Nicholas II with a request of registering his three daughters under his last name. His request was not satisfied. In 1913, Chaliapin was introduced to London and Paris by the brilliant entrepreneur Sergei Diaghilev. He began giving well-received solo recitals in Paris in which he sang traditional Russian folk songs as well as more serious fare, and also performed at the Paris Opera. His acting and singing was sensational to the western audiences. He made many sound recordings, of which the 1913 recordings of the Russian folk songs Vdol po Piterskoi and The Song of the Volga Boatmen are best known. In 1915, he made his film debut as Czar Ivan IV the Terrible in the silent Russian film Tsar Ivan Vasilevich Groznyy/Czar Ivan the Terrible (Aleksandr Ivanov-Gai, 1915) opposite the later director Richard Boleslawski. Fourteen years later, he appeared in another silent film, the German-Czech coproduction Aufruhr des Blutes/Riot of the blood (Victor Trivas, 1929) with Vera Voronina and Oscar Marion. 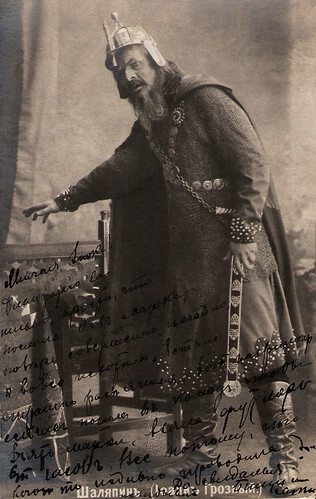 Feodor Chaliapin as as Czar Ivan the Terrible. 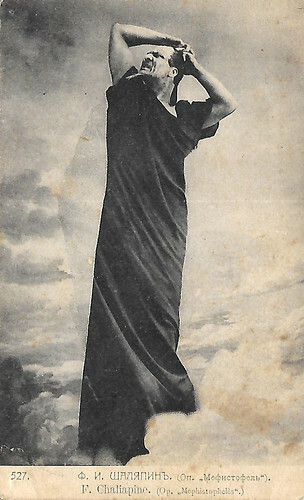 Russian postcard, sent by mail in 1905. 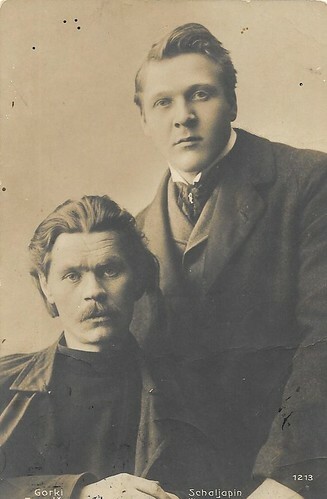 Maxim Gorky and Feodor Chaliapin. Russian postcard. Collection: Didier Hanson. 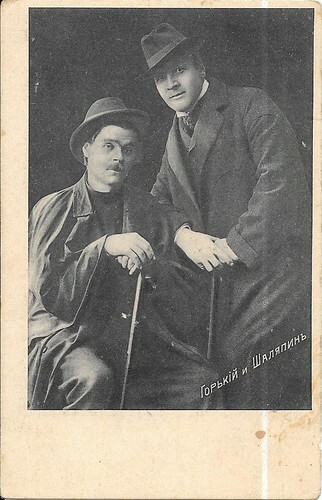 Chaliapin collaborated with Gorky, who wrote and edited his memoirs, which he published in 1933. They broke after the publication. Maxim Gorky and Feodor Chaliapin. Russian postcard, no. 1213. Collection: Didier Hanson. Feodor Chaliapin. Russian postcard. Collection: Didier Hanson. Feodor Chaliapin was torn between his two families for many years, living with one in Moscow, and with another in St. Petersburg. With Maria Petzhold and their three daughters, he left Russia in 1922 as part of an extended tour of western Europe. They would never return. The family settled in Paris. A man of lower-class origins, Chaliapin was not unsympathetic to the Bolshevik Revolution and his emigration from Russia was painful. Although he had left Russia for good, he remained a tax-paying citizen of Soviet Russia for several years. Finally he could divorce in 1927 and marry Maria Petzhold. 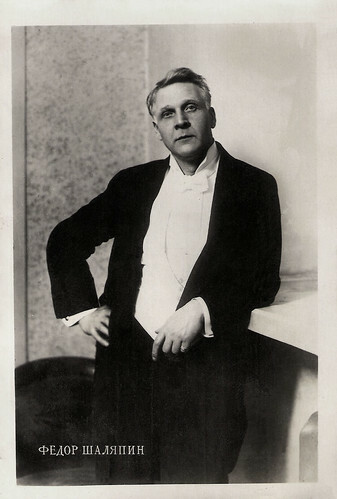 Chaliapin worked for impresario Sol Hurok and from 1921 on, he sang for eight seasons at the Metropolitan Opera in New York. 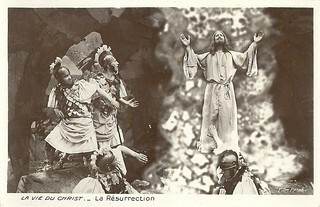 His debut at the Met in the 1907 season had been disappointing due to the unprecedented frankness of his stage acting. In 1921, the public in New York had grown more broad-minded and the eight seasons were a huge success. 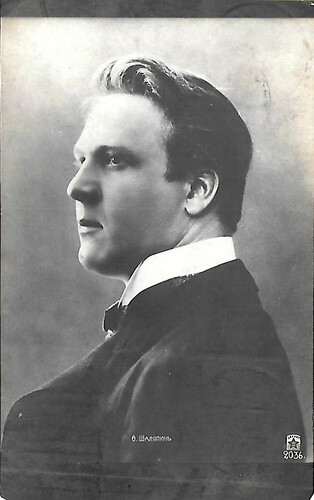 According to Steve Shelokhonov at IMDb, Chaliapin was the undisputed best basso in the first half of the 20th century. He had revolutionised opera by bringing serious acting in combination with great singing. His first open break with the Soviet regime occurred in 1927 when the government, as part of its campaign to pressure him into returning to Russia, stripped him of his title of 'The First People’s Artist of the Soviet Republic' and threatened to deprive him of Soviet citizenship. Prodded by Joseph Stalin, Chaliapin’s longtime friend Maxim Gorky tried to persuade him to return to Russia. Gorky broke with him after Chaliapin published his memoirs, Man and Mask: Forty Years in the Life of a Singer (Maska i dusha, 1932), in which he denounced the lack of freedom under the Bolsheviks. The only sound film which shows Chaliapin's acting style is Don Quixote/Adventures of Don Quixote (Georg Wilhelm Pabst, 1933). He had also starred onstage as the knight in Jules Massenet's 1910 opera, Don Quichotte, but the 1933 film does not use Massenet's music, and is more faithful to Miguel de Cervantes' novel than the opera. In fact there were three versions of this early sound film. Georg Wilhelm Pabst shot simultaneously with the German language version also English and French versions. Feodor Chaliapin Sr. starred in all three versions of Don Quixote, but with a different supporting cast. 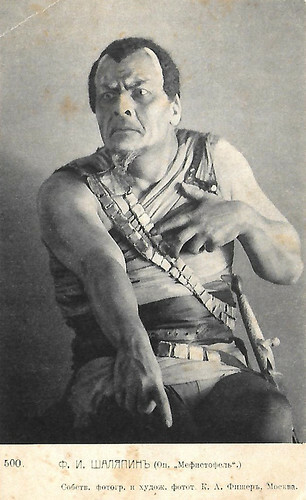 Sancho Pansa was played by Dorville in the German and French versions but by George Robey in the English version. Benoit A. Racine at IMDb: "These films (the French, English and German versions) were an attempt to capture his legendary stage performance of this character even though the songs are by Jacques Ibert. Ravel had also been asked to compose the songs for the film but he missed the deadline and his songs survive on their own with texts that are different from those found here. The interplay between the French and English versions is fascinating. Some scenes are done exactly the same for better or worse, some use the same footage, re-cut to edit out performance problems, while others have slight variants in staging and dialogue. 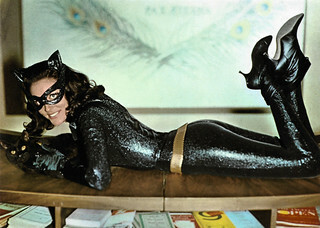 (The English version was doctored by Australian-born scriptwriter and director John Farrow, Mia's father, by the way.) Even though the films are short and they transform, reduce and simplify considerably the original novel, they still manage to carry the themes and the feeling that would make Man of La Mancha a hit several decades later and to be evocative of Cervantes' Spain." In the late 1930s, Feodor Chaliapin Sr. suffered from leukaemia and kidney ailment. In 1937, he died in Paris, France. He was laid to rest is the Novodevichy Monastery Cemetery in Moscow. Chaliapin was awarded a Star on the Hollywood Walk of Fame for Recording at 6770 Hollywood Boulevard in Hollywood, California. In 1998, the TV film Chaliapin: The Enchanter (Elisabeth Kapnist, 1998) followed. His son Boris Chaliapin became a famous painter. who painted the portraits used on 414 covers of the Time magazine between 1942 and 1970. Another son Feodor Chaliapin Jr. became a film actor, who appeared in character roles in such films as the Western Buffalo Bill, l'eroe del far west/Buffalo Bill (Mario Costa, 1965) with Gordon Scott, and Der Name der Rose/The Name of the Rose (Jean-Jacques Annaud, 1986), starring Sean Connery. His first wife, Iola Tornagi, lived in the Soviet Union until 1959, when Nikita Khrushchev brought the 'Thaw'. Tornagi was allowed to leave the Soviet Union and reunited with her son Feodor Chaliapin Jr, in Rome, Italy. Russian postcard, no. 495. Photo: K. Fisher. 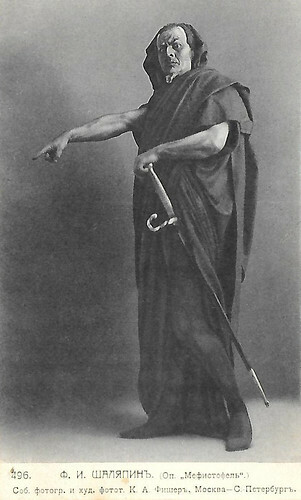 Publicity still for the stage production of Arrigo Boito's opera Mefistofele. Collection: Didier Hanson. Russian postcard, no. 496. Photo: K. Fisher. Publicity still for the stage production of Arrigo Boito's opera Mefistofele. Collection: Didier Hanson. Russian postcard, no. 499. Photo: K. Fisher. Publicity still for the stage production of Arrigo Boito's opera Mefistofele. Collection: Didier Hanson. Russian postcard, no. 500. Photo: K. Fisher. Publicity still for the stage production of Arrigo Boito's opera Mefistofele. Collection: Didier Hanson. Russian postcard, no. 521. Photo: K. Fisher. Publicity still for the stage production of Arrigo Boito's opera Mefistofele. Collection: Didier Hanson. Don Quichote/Adventures of Don Quixote (1933). Source: LikeManyThingThings (YouTube). Sources: Steve Shelokhonov (IMDb), Benoit A. Racine (IMDb), Encyclopaedia Britannica, Wikipedia and IMDb.